I have been frequently asked by visitors, "where do you get gas in the city? - I don't see any gas stations." Or, "are there any supermarkets?" Blinded by the oversaturation of stimuli and the plethora of all things manmade, the last thing noticed in the city are the mundane, particularly those places that provide basic services. But all the basic services do exist, tucked away here and there, perhaps in atypical and unlikely places. Laundry, dry cleaning, shoe repair, auto repair shops, street level doctors' offices, hardware, paint supplies, plumbing supplies, lumberyards, gas stations, supermarkets, schools and palygrounds. The number of many of these has declined substantially as the real estate market has heated up, but they all can still be found. One of the most mysterious things to me is the public and private schools. Virtually invisible, yet there are 1,400 schools in the five boroughs. And children need to play. Here, at one of the busiest intersections in Manhattan, Houston Street and 6th Avenue, we have the Playground of the Americas. But you never really notice it. 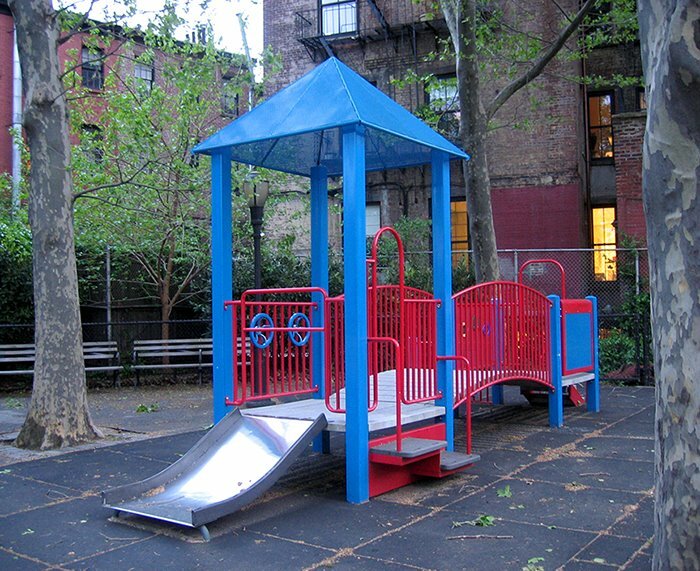 In fact, I have walked by this playground for years and this is the first time I have really looked at it. Note: The story of the Mary Celeste is a fascinating tale - see story here.